Do what?!? Either he was kidding or he was a true city-slicker. Turns out after being questioned that he really didn’t know the difference in regard to whether it was a male or female that gave milk! The one who had won the wager laughed and said, “If I had known you didn’t know the difference I would have brought a bull in here for you to milk.” That would have been a sight to see! When it comes to milking a cow, it pays to know the difference between a dairy cow and a bull! It wouldn’t be wise to try and milk an ornery ol’ bull. The consequence might not turn out too well! I got to thinking, as one goes through life it pays to know the difference when it comes to a variety of matters. Let me mention a few, and I am sure you can think of many more. It pays to know the difference between what is truly valuable and what is not. Often we think the truly valuable is found in material possessions: a new car, fine house, wearing name-brand clothes, a bank account that is running over, having the latest smart-phone and the list goes on. Those “things” are all well and good, but they can all be lost at the snap of a finger. What is truly valuable is not found in “things” but are found in the richness of relationships, love, caring, family, faith, health and the precious gift of life we are granted each day by the Lord’s grace. When all the glitter of “things” is stripped away from us or the “c” word becomes part our vocabularies, then we quickly learn the difference between what is valuable and what is not. It pays to know the difference between what is morally right and wrong. We are living in a day when many don’t seem to know the difference. They don’t know the difference because they have neglected the Manual that tells us the difference. The Bible is our eternal guide that contains within its inspired pages directions on how best to live morally so our lives will not end up being derailed because of morally bad choices. It is when we “do according to all that is written therein” that we “have good success” in life (Joshua 1:8). It pays to know the difference between telling the truth and lying. Seems in our society today the line between telling the truth and lying has been blurred. Our nation’s leaders lie without giving it a second thought, their character to a great extent being a reflection of society. Lies are told because the person telling them has no core values. As a lad growing up my father, by placing his hand on a certain part of my anatomy, had a way of helping me remember there is a difference between telling the truth and lying and the consequences that occurs when an untruth is mouthed! Telling the truth keeps us from having to remember the lie we told and spare us from later grief. It pays to know the difference between yes and no. Have we forgotten the power of those two words? They can be used negatively or positively. When we say “yes” to the good and “no” to the bad we can expect good consequences to result. However, if we say “yes” to the bad and “no” to the good then consequences of regret will be our companion. It pays to know the difference between when to let go and when to hold on. 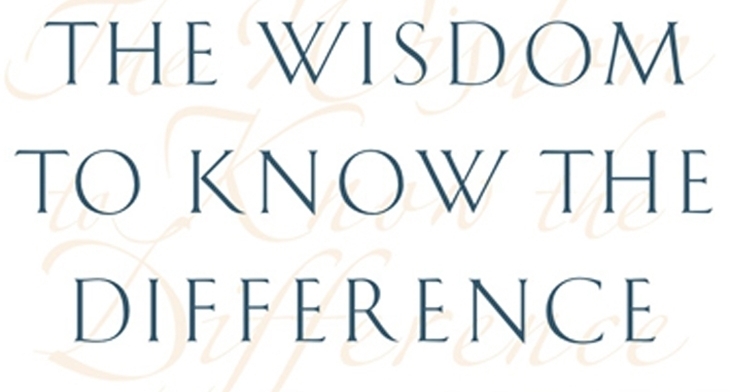 We need wisdom to know the difference in many areas of our lives. Such wisdom is needed in regard to relationships, jobs, places of service, habits, attitudes, etc. Knowing when to let go and when to hold on determines continuing to experiencing the Lord’s blessings where we are or to walk through a new door of opportunity where awaits us new blessings from Him. It pays to know the difference between the temporal and the eternal. The minute we are born the march to death begins, yet people seem to think they will never die and will never have to one day stand before the Creator and give an account for their lives. The Bible clearly says, “It is appointed unto man once to die after that the judgment” (Heb. 9:27). Wise is the person who realizes that this life is temporal and only in Christ will we be prepared to face the eternity that awaits us all. It pays to know the difference between a relationship with Christ and religion. There are those who will tell you any religion will do for we are all striving to get to the same “place.” There is just one huge problem in adopting such a philosophy, what about the problem of sin? What about our sins that have separated us from a holy God? How is that matter going to be dealt with, for we all have sinned and come short of the glory of God (Romans 3:23)? The religions of man cannot answer the sin question. Thankfully, the Christ of the cross dealt with our sin which separates us from the Holy Father. He came to do for us what we could not do for ourselves. He became our Substitute, living for us the holy life God demands and then incurring on the cross the just payment required for our sin. Only Christianity solves the sin problem. One’s eternal destiny depends on knowing the difference between embracing Christ in a faith relationship and the woeful inadequacy of man-made religion. Yes, there are many matters in life it pays to know the difference. Knowing the difference when confronted with the many issues that demand wisdom and discernment throughout our lives, not only determines our destiny on earth, it will determine our eternal destiny which is of the utmost importance.